Looking at Judas Iscariot from the lens of the teachings of Christ. 1. We intended to challenge the group to question how we are personally appropriating who Jesus is and what Jesus has done for humankind. 2. We clearly indicated that the goal of the discussion is to open a conversation about the expanse of God’s love and grace. 3. We explained that the point of the study is to look at Judas Iscariot from the lens by which Jesus’ new command of love has instructed us to follow. Each person can draw an independent conclusion. 1. We only had about 30 to 40 minutes to present it. 2. We only devoted a week of research and a few days to deliberate and consolidate our thoughts (although, honestly, I didn’t see the few days of deliberation as a limitation because I believe that the basis of how we discuss the materials is tied to how we see God’s grace. If the appropriation of God’s grace is just a matter of morality, ethics, and human justice, the assignment is easy.). 3. We are not trained biblical scholars. The name Judas comes from the Greek name Judah which means “God is praised.” It was a common name among Jews of his time. The name in today’s time is the most dishonored and hated name in all of human history. Would you name your son Judas? In fact, in Germany, it is unlawful to name your child with that name. Judas Iscariot came from the territory of Judah in the south. He was from a village of Kerioth. His father was Simon Iscariot (John 6: 71). He was the only one of the 12 disciples that wasn’t from Galilee. – He was appointed by Jesus as Keeper of the Purse. – The deliverer of the Lamb of God to the altar of sacrifice. Where there moments in your life where you formed a conclusive opinion of a person’s character based on incomplete information? Was there a situation that prompted you to mostly assess what’s happening based on your emotional reaction if not a personal attachment to it? There aren’t enough biblical references and facts in the Bible that give a clear picture of Judas’ character prior to his betrayal of Jesus. Matthew, for instance, was a tax collector. Tax collectors during that period are known for their deceit and for increasing the collection so they can enrich their coffers. There was not enough information about Judas to give a sense that he was a thief or that he stole from the apostolic purse other than the words of John which were written many years after the death and resurrection of Christ. The 11 disciples were with Judas during the three years that they were taught by Jesus and had done missionary work on foot with Christ. And even when Jesus finally sent Judas off to carry out his betrayal, they didn’t seem to suspect him, although John was tipped off by Jesus Himself as to who it was who would betray Jesus during the Passover meal, he still had no idea up to that point that Judas was conspiring against the Messiah for money. What we have about the character of Judas prior to the betrayal are at best just conjectures. However, Matthew wrote a slightly different recollection of the event. Clearly, if you read John’s prose (which he wrote in his old age) you’ll see that he didn’t really like Judas. Would you blame him, though? However, could it also be that John, blinded by His resentment and enraged feelings towards Judas’ betrayal of Jesus, possibly failed to fully grasp Jesus’ New Command of love (humility, kindness, and mercy even towards your offender) that was methodically demonstrated to them in the Last Supper? Let’s go back to Matthew 26. In the end, it was a shock to the 11 disciples that Judas would conspire with the chief priests for 30 pieces of silver. (Matthew 26:15). Is the betrayal the beginning and the end of the story of Judas and Jesus? Under the Covenant of Grace is there such a thing as an unforgivable sin? Jewish settlement first came to ancient Egypt when Joseph son of Jacob who founded 12 tribes of Israel moved his family there during the famine in Canaan. Passover commemorates the story of the Israelites departure from ancient Egypt. Jews observe the weeklong festival with a number of important rituals, including a traditional Passover meal which is known as the seder, the removal of leavened products from their home, the substitution of matzo for bread and the retelling of the exodus tale. In the original Passover in Egypt, it was not considered to be finished until the host declared the sacrificial lamb to have been fully consumed. Exodus 12:8-10. Under the covenant of law, the worshipers were not considered fully absolved of sin by the sacrifice ritual until the officiating priest loudly declare the Hebrew word “kalah” which means finished. And a priest would only say kalah after the last lamb of the day had been ritually slain and consumed. We Christians refer to the Upper Room Passover meal as the “Last Supper.” Note that the last words written to have been cried out by Jesus from the cross was, “It is finished” — kalah. Just like in the ceremonial festivity of Passover, let’s examine what’s in the Passover that was led by Christ. Let’s see what elements of God’s plan for the redemption of humankind are to be found there. 1. The officiating Great High Priest —Jesus Christ. 2. 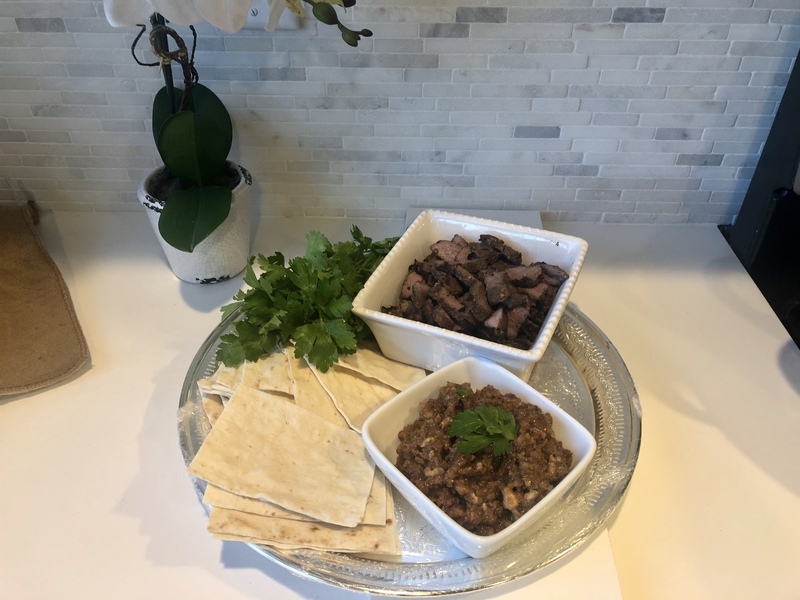 The Seder plate (unleavened bread, bitter herbs, lamb, charoset- a mixture of fruits, nuts, and wine). The lamb is a remembrance of the feast of God’s salvation. The blood of a spotless lamb is a symbol of salvation in Egypt. Jesus is the Lamb of God that takes away the sins of the world. The matzah symbolizes the hardship of slavery and the Jewish people’s hasty transition to freedom. 3. The bath ritual —- the washing of the feet by Jesus of His 12 disciples. Each of the 12 disciples, In anticipation of the Passover, would’ve already administered a mikveh bath, in order to be ceremoniously clean (John11:55). Of course, the Scripture is clear that none of those rituals could really take away sin (Romans 3:20). In washing His disciples’ feet, Jesus was symbolically demonstrating to them the new commandment of love. Jesus was fully aware that Judas had conspired against Him. Through the lowly act of washing somebody’s feet (including an individual who would represent the worst of the humankind), by the Messiah –the only faultless human being — Jesus was pointing ahead to a “new order” of spiritual things. Again, the Scripture is clear that none of those rituals could really take away sin. 4. The true sacrificial Lamb displayed and devoured. 5. The 12 representative descendants of fallen humanity. Of course, the disciples had been recipients of Christ ’s loving words and acts before. But in the Upper Room and at the Last Supper, He would demonstrate and command a new dimension of love. Judas would serve as an extreme example of what the term “unmerited favor” really means. Does God’s mercy require a person’s suitability? Is God’s grace based on the individual’s meeting of specific requirements? Did Jesus cease to love Judas? Remember the words of apostle Paul respecting the non-believing Jews of his day. Romans 11:28-29 NLT: Many of the people of Israel are now enemies of the Good News, and this benefits you Gentiles. Yet they are still the people he loves because he chose their ancestors Abraham, Isaac, and Jacob. For God’s gifts and his call can never be withdrawn. Here are the words of Jesus when He addressed the multitude in His sermon on the Mount, Matthew 5:44-45: But I say, love your enemies! Pray for those who persecute you! In that way, you will be acting as true children of your Father in heaven. For he gives his sunlight to both the evil and the good, and he sends rain on the just and the unjust alike. Would Jesus command others to love their enemies and fail to love His – even Judas — who is the epitome of Christ’s human enemies? Do you believe that Jesus would tell and demonstrate to the 12 disciples in the Upper Room a new order of love and not follow it Himself? If Jesus was to demonstrate the full extent of his love (John 13:1), what better example could He have chosen than Judas? He washed and dried Judas feet. He gave Him the bread, a piece of the sacrificial lamb, and the wine. He did not reject Judas’ kiss and referred to Him as a friend. Judas was the “Adamic” representative of everything worse in a human planted a kiss on the One and Only faultless human, the antitype of all animal sacrifices ever slain on any Israel altars. With his kiss, Judas touched the Lamb of God who takes away the sin of the world – the only True Sacrifice. 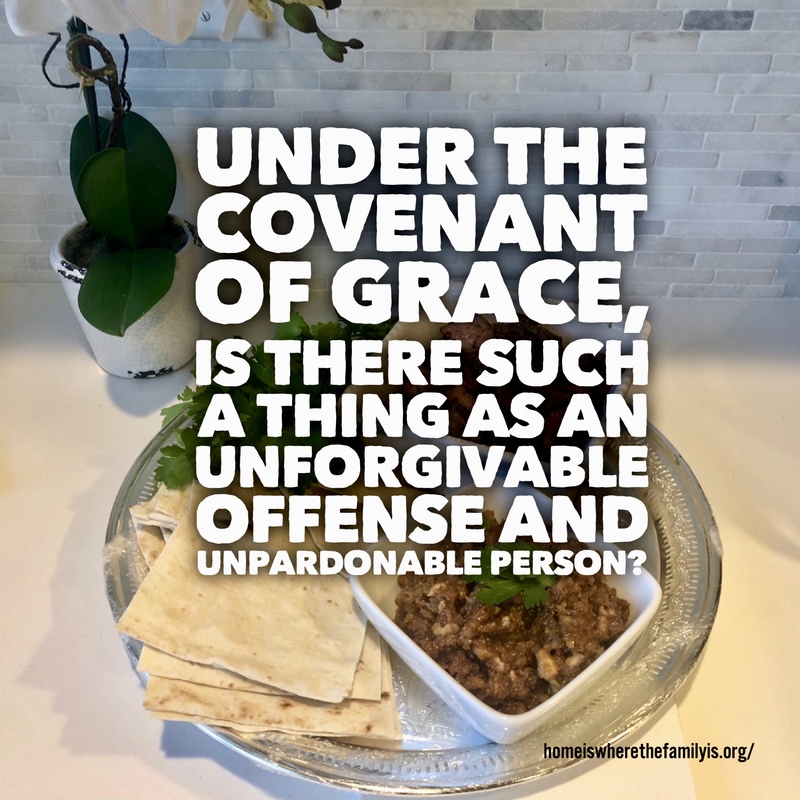 Under the Covenant of Grace, is there such a thing as an unforgivable sin or an unpardonable person? “While I was with them, I protected them and kept them safe by that name you gave me. None has been lost except the one doomed to destruction so that Scripture would be fulfilled” (John 17: 12) “I have not lost one of those you gave me” (John 18: 9) How is it that Jesus can say in one place that Judas, one of his God-given disciples, is lost but in another place be quoted as having said, “I have not lost one of those you gave me” ? 1. The lost ones in the parables were never written off by their owner or father. 2. The lost mentioned in the parable was inevitably recovered by the owner or the father. In the end, God only gave us two Commandments. Love God with all your heart and love one another as I have loved you. The question is how do you appropriate who Jesus is and what Jesus has done for humankind. If you are to spend a life of your eternity in the presence of God the father, Jesus, and the Holy Spirit, you’re there by virtue of who Christ is and what he did and not by virtue of what you did, or what race, religion, cultural and financial standing you were born. The motivation of this study isn’t to put Judas Iscariot on trial. It isn’t to debate the discrepancies between the Gospels of John and Matthew nor to argue about the intent of John. The purpose of tonight‘s discussion is to revisit the principle of God’s Divine Grace and re-examine the New Order of love that Christ had methodically shown and told His disciples. As recorded in the Scripture the New Order of Love was inaugurated in the Upper Room and into the completion of the Last Supper. The goal of tonight’s discussion is to open a conversation about the expanse of God’s love and grace. The point of our study is to look at Judas Iscariot from the lens by which Jesus’ new command of love has instructed us to follow.